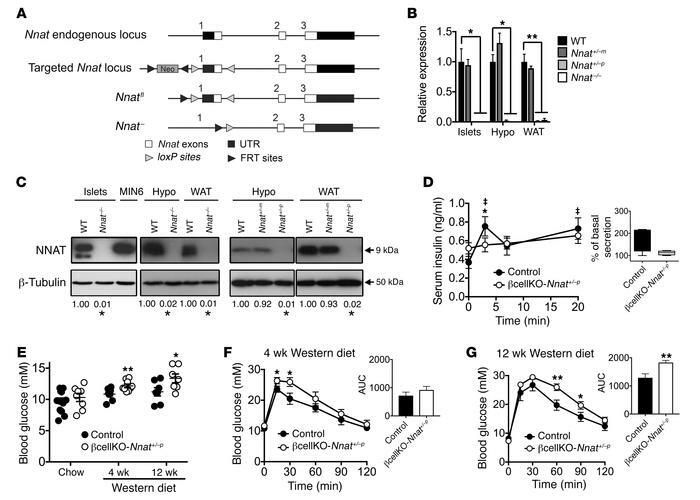 Effect of Nnat deficiency in vivo. (A) Targeted inactivation of the Nnat gene. Exon 1 was flanked by loxP sites with the neomycin selection cassette (Neo) flanked by FRT sites, to produce a floxed and null allele. (B and C) Quantitative RT-PCR and representative Western blot analysis of Nnat expression in tissues of WT, heterozygous Nnat+/–m (maternal deletion), heterozygous Nnat+/–p (paternal deletion), and homozygous Nnat–/– mice on C57BL/6J background. Data are compared with WT mice (n = 4–7 animals per group, Kruskal-Wallis or Mann-Whitney U test). (D) Measurement of insulin secretion in vivo in response to i.p. glucose in 10-week-old male βcellKO-Nnat+/–p versus control mice on C57BL/6J background (n = 8 animals per genotype, ANOVA with repeated measures). Inset shows box-and-whisker plot of the same data plotted as percentage insulin secretion across all time points compared with basal insulin values (at T = 0). (“‡” indicates statistically significant increases, P < 0.05, in secretion in WT mice compared with basal insulin values.) (E) Fasted (4-hour) blood glucose levels from 10-week-old chow-fed male βcellKO-Nnat+/–p versus control mice and from male mice of both genotypes fed Western diet for 4 weeks (14 weeks old) and 12 weeks (22 weeks old) (Student’s t test for each time point, all C57BL/6J, n = 7–14 animals per genotype, per time point, minimum 2 independent cohorts). (F and G) Glucose tolerance in overnight-fasted Western diet–fed groups as in E (ANOVA with repeated measures). Insets show means of area under the curve (AUC) for both genotypes at both time points (Student’s t test for each). (*P < 0.05, **P < 0.01).